In the blog post Do We Care?, I hit on the main points of financially supporting public radio and television. However, when you are disappointed in any organization whether it is an elected official, retail business, or a public radio broadcast group, it is important to speak up and speak out. Below is the letter I submitted via NPR.org. If you are as hopping mad as I am than you should go to NPR.org and SPEAK UP and SPEAK OUT!!! I am very disappointed in today’s news of ‘Tell Me More’ being cancelled effective August 1st. I support both my local public radio station in Columbia, SC WLTR and my hometown station Chicago, IL WBEZ. I give to help with a nominal amount of $15 monthly for an annual $180 to WBEZ because I love my hometown. So I come to you not merely as someone with a compliant but someone who does support if only in a small way. I believe that you have gotten it wrong choosing to cancel a show, I believe the only show specifically marketed to the African American community by NPR. I have written my initial disappointment in the form of a blog via http://paisleyperspective.com. The focus initially was the need to support public radio, however, I believe public radio must also support diversity. I understand the reality that often decisions come down to dollars and cents but sometimes it has to be more than the money. i support public radio and television because of the vision to think outside the norm. This is done with some shows such as ‘Car Talk’ and ‘Wait Wait Don’t Tell Me’ but why with its EXCELLENT content did ‘Tell Me More’ not make the cut. As an African American listener I need diversity and shows that speak to me and my experiences in an intelligent insightful way. Finally, what if anything can I a listener do to make you the big wigs change your mind? Disclaimer: The advertisements shown on this page are not endorsed by PaisleyPerspecitive LLC or PaisleyPerspective.com, they are independently selected by WordPress.com. 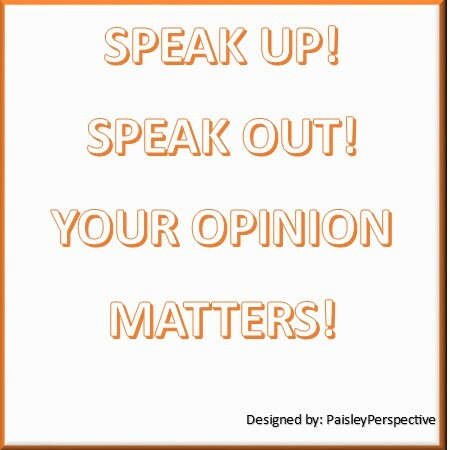 Please make comments or contact us at info@paisleyperspective.com if you notice any offensive ads or videos.